It’s a bit hard to tell in this photo what we’re looking at. 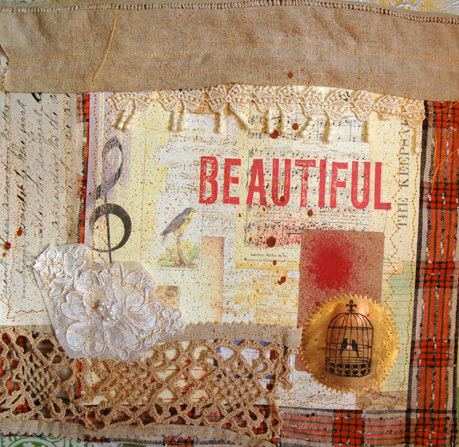 The foundation is a piece of scrapbook paper designed by Tim Holtz. On top of that is a quilted collage that is stitched together, made entirely of paper items, which in turn has been stitched down to the foundation. 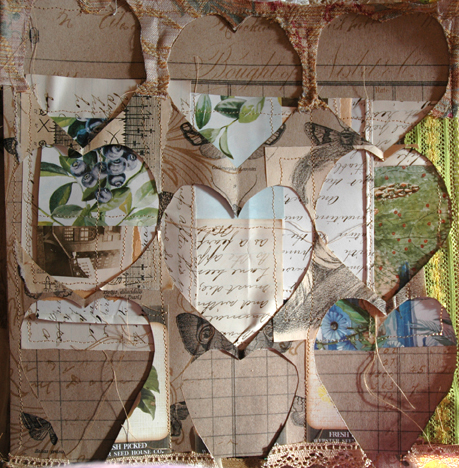 The top layer is one of my stitched collages made from both fabric and paper that did not suit me after it was done, so I cut it up into heart shapes to use on future stitched collages. 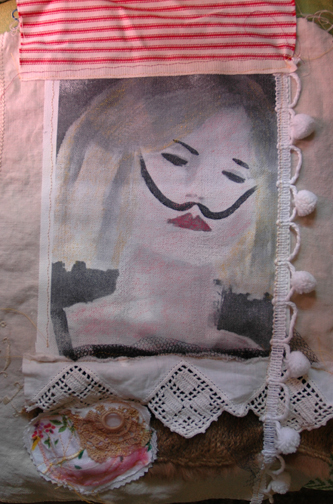 The “waste” as it might be called, was then stitched overtop the two previous pieces. This is one of those items that loses a little in photographic translation…it is easier to see what you are looking at IRL and to discern what it is. 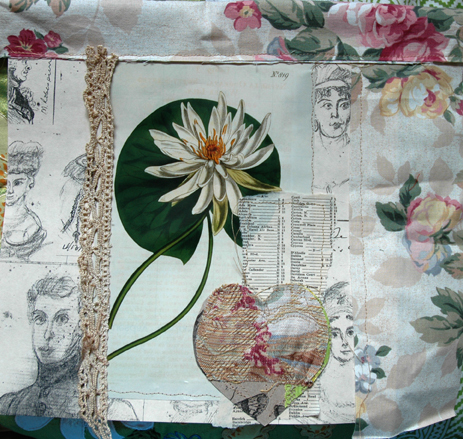 A stitched paper and fabric collage using a botanical print and drawings on paper with lace, a handmade heart, map and chintz fabric. The drawings are of Napoleon’s entourage, by an unknown artist whose work I picked up at an estate sale. My sewing skills are improving as I make these simple collages almost every day. I enjoy occasionally putting a lot into a collage and then being dissatisfied with it enough to deconstruct it and cut it up into as many heart shapes as I can get out of the project. The hearts are usually way more interesting than the original project. Don’t forget your “failures” can turn into great opportunities if you refuse to let things get precious and are willing to either take them apart or really alter them significantly. 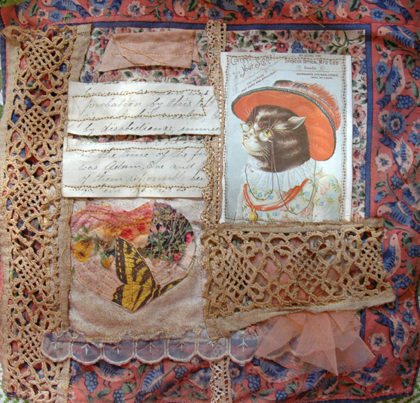 A printed napkin is the foundation for this stitched collage featuring a vintage postcard image, lace, handmade stitched heart and vintage handwriting on old lined paper. There is some eyelet edging and tulle thrown in for good measure. The cat is wearing eyeglasses which cracks me up because my cat is cross eyed and needs them. She could also use that good looking hat and not the junk mail paper hat that Bob insists she wear each day when she helps him sort the mail. Perhaps this verges on “too much information”. A print of my original portrait of a model named Jennifer at one of ARTpool Gallery’s soirees is featured in this stitched collage. Vintage linen, pom pom fringe, lace and a handmade heart stitched to a linen background. The print was toned with pink watercolor crayon. I’ve been doing a lot of stitched pieces lately and four of them are hanging in the gallery for $45 now. P.S. There are new photo galleries at pisces-rising.com! Mixed media stitched collage featuring an original photograph, vintage dish towel, handmade collage stitched heart, embroidered fabric and some kind of weird vintage trim that is pleated vinyl. Along the left side is some commercial fabric and wool embroidery yarn. AFter stitching the whole thing was dunked into leftover morning coffee. I call this mannaquin “little girl lost” because that is what I always think when I see her and I’ve used her several times already in various pieces. I found her at the fabulous ARTpool Gallery, where Moi is having a show in September 2012 as the featured artist. Just found out that news on Friday. 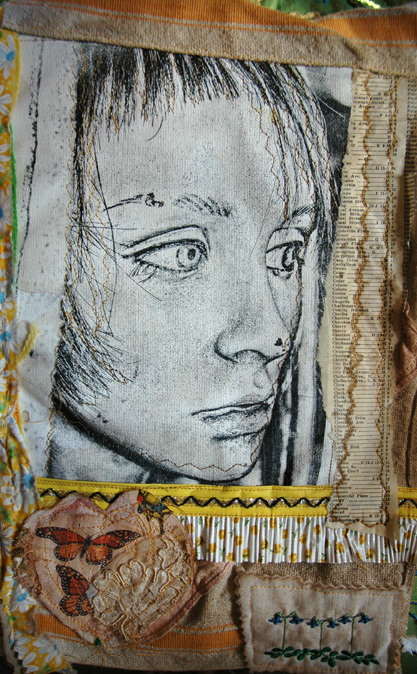 The second piece in the series of stitched mixed media textiles. This one uses a scrapbook paper altered with spray ink and a gold seal with a birdcage stamped on it. Embellishments include an old handwritten sermon fragment, wedding dress applique, lace panel and linen, the foundation being a plaid napkin. The series of four are now hanging at the fabulous ARTpool Gallery in St. Pete, on repurposed wooden hangers.